He served as a judge and evaluator. 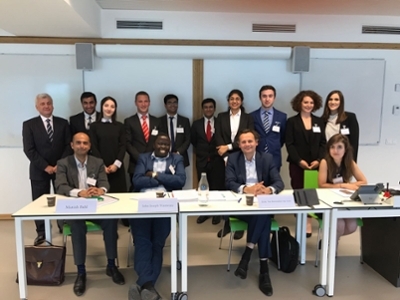 John Wamwara (LLM 2017, SJD) served as a judge and evaluator at the finals of the International Criminal Court Moot Court Competition in The Hague, Netherlands, an event that drew 64 teams from 46 countries. Wamwara was chosen for his experience in international criminal law, international humanitarian law, and public international law. He is an advocate of High Court of Kenya, a former legal officer with the International Committee of the Red Cross at the Nairobi Regional Delegation, and he has worked for the Kenya National Commission on Human Rights and the Kenyan Parliament. As an evaluator, he assessed briefs submitted by teams, and as a judge he heard oral arguments, presiding over three sessions. Leiden University in the Netherlands won the competition. Ben Ferencz, the last surviving Nuremberg prosecutor, opened the competition with a speech on the importance of promoting international Criminal justice, ending impunity, and the horrors of war. "He made a very compelling reason for making a life commitment to international criminal justice," Wamwara said. Wamwara appreciated the opportunity to network with judges, professors, and legal professionals in the field of international law as well as mentoring students aspiring to join the field. While in the Netherlands, he gave a presentation to the Dutch Ministry of Foreign Affairs as part of an informal discussion with the Dutch officers involved with international law and policy matters. He spoke on contemporary challenges to international law in light of the rise of nationalism in Europe and the United States. The group discussed the challenges of realizing a stronger implementation mechanism for the Geneva Conventions of 1949, the future of international criminal justice, and the role the Netherlands can play in promoting international law, especially in their role as members of the United Nations Security Council. Wamwara's participation was sponsored by CSLR's new Student Scholarship Advancement Fund, which helps students cover the cost of attending conferences, meetings, trainings, workshops, and other experiences that advance students' scholarly development and professional skills.